I am very happy today to welcome L. Blankenship as a guest author. I met L. Blankenship through the Magic Appreciation Tour. L. Blankenship has written a great post on the unique magic system of her Disciple series. Please join me in welcoming her to the blog! 1. All magical charms (spells) are fueled by kir. 2. The laws of physics, conservation of mass and energy, etc., fully apply. 3. No other “para-normal” forces or beings actually exist. Kir is sort of a cold plasma that’s reactive to willpower. The stuff wells up out of the earth in select places called founts. Kir founts always involve a water spring as well, regardless of whether a spring “ought” to be in that location, and kir-laced water is especially bright, clear, and attractive. There’s energy inherent in kir. In its raw state, it takes the form of a green mist that even un-gifted people (or animals) can detect when it’s close by or concentrated. Drinking kir-laced water or absorbing raw kir is energizing for anybody, but few people get the chance to do that. Since kir is in limited supply, it’s carefully controlled. Humans generate small amounts of surplus kir simply by living — it’s an energy reserve, both biological and mental. It’s only enough for one small charm every few days, though. Once used in a charm, kir disintegrates and returns to the earth. No teleportation. Time/space can’t be torn open, worm-holed or otherwise screwed with. No true telepathy or mind reading. Body language can be read to a fine degree and that can resemble mind-reading. Saint-bonds allow for a limited sort of telepathy. Conservation of mass applies to shape-shifters, though they can play with their density a bit if they are skilled enough. Line-of-sight limitation. Charms cannot be targeted at something or someone the caster cannot see. If the enemy’s standing behind a door, it’s perfectly legit to kill him by ramming the door into the far wall — but you can’t telekinetically reach through the keyhole and strangle him, for example. Only kir cuts kir. When it’s acting under the influence of a mage, kir can project force. It can be a club or a blade, but no ordinary club or blade can break it. Kir-blades also have an unnerving ability to “skip” armor or flesh and cut through the victim’s vitals. So when a kir-mage goes on a rampage, the goodfolk’s only defense is another kir-mage. The goodfolk believe in kobolds (goblins), shades (ghosts), various denizens of the Winter Wood (hell), and things like luck, fate, or prophetic visions — but these spring from the same roots as they do in our world. Everyone has at least a little ability to manipulate kir. Training will improve one’s skill, but the ultimate limit is determined by innate talent. Technically speaking, this a multi-factor para-genomic predisposition which I am not going to clarify any further than that. Saints are the strongest of the kir-mages, and the Elect are the next step down. It’s said that there might be a hundred saints in the world, at any given time. Perhaps two or three hundred Elect. As of Disciple, Part V, Kate has reached the rank of Elect and works directly with Saint Qadeem in defending the kingdom against the invading Empire. The rest of her life, however, is in shambles. Love and war have both taken their toll on her, but she must find her strength and face the final attack. Kate faces winter with a broken heart: betrayed by one lover, the other lost to her. Kiefan will not give up on the alliance his kingdom desperately needs — even though the Caer queen refuses to speak to him. Anders, alone and despairing, faces the Empress’s seductive offers of power and privilege. Each of them must carry the ongoing war in their own way, whether cold, alone, or backed into a corner. Each must patch together a broken heart as best they can. Duty will throw them together soon enough and they must be ready. 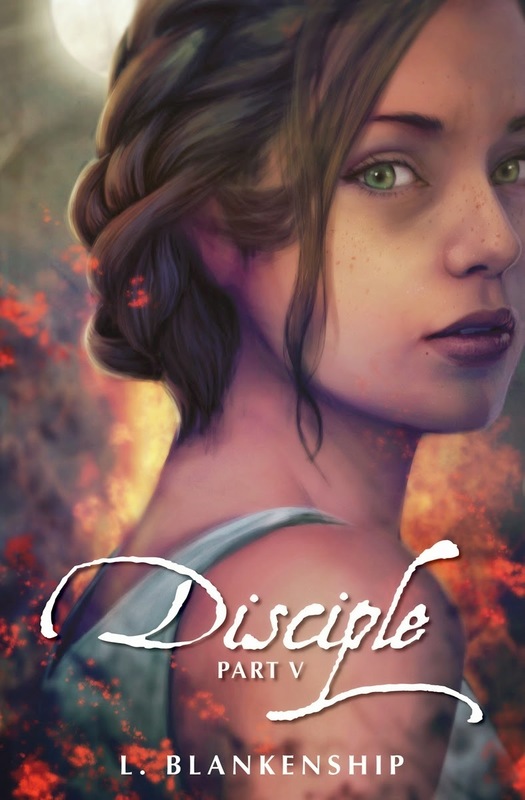 Disciple, Part VI ends the series early next year! I love a well-thought out world, one the author knows every in and out of, even if the reader never gets all of it.